Let’s get to the fun. When a show starts with one of the most legendary wrestlers in Joshi history, that is never a bad thing. 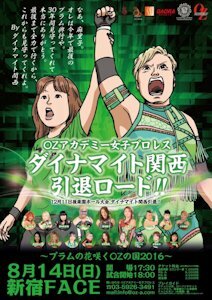 Toyota here takes on the young Aoi Kizuki, another Freelancer that frequently wrestles in Oz Academy. This probably won’t be an overly serious match but still could be a cute opener. They begin with a simple tie-up, Kizuki goes for a crossbody but Toyota catches her and throws Kizuki to the mat. Missile dropkick by Toyota, she gets on the second turnbuckle but Kizuki knocks her down to the floor. Kizuki puts on her rainbow cloak, she gets on the top turnbuckle and dives out of the ring onto Toyota. Kizuki rams Toyota into the apron but she is thrown into the stands by the veteran. Manami Roll by Toyota and both wrestlers quickly roll back in the ring so that they can beat the count. Toyota and Kizuki trade strikes, big boot by Toyota and she gets Kizuki on her shoulders but Kizuki slides away, roll-up by Toyota but it gets a two. Kizuki goes for a few quick pin attempts with no luck, jumping lariat by Kizuki and she hits the Northern Lights Suplex for two. Kizuki goes up top but Toyota gets her feet up on the Swivel Body Press attempt, scissors kick by Toyota and she covers Kizuki for two. Scissors kick by Toyota, she gets on the second turnbuckle and hits a sunset flip, but Kizuki rolls out of it and applies a jackknife for the three count! Aoi Kizuki is the winner. As I figured, this was a pretty quick and simple match, neither really hit any big moves aside from Kizuki’s slow motion dive outside of the ring since it took her 30 seconds to get her cloak on. Not really a whole lot to say about it, always enjoy seeing Toyota but nothing much to this one. Business is picking up a little bit as we get to our next match, which features two of my podcast partner’s favorite wrestlers. Matsumoto is a Freelancer that many best know for her work in Stardom, while Yamashita is officially affiliated with Daijo Pro but wrestles frequently in Pro Wrestling WAVE with a lot of success. On the other side, Yoneyama also wrestles in Stardom but is affiliated with YMZ, and Kuragaki is a Freelancer that wrestles mostly in OZ Academy and JWP. Yamashita is the least experienced wrestler in the match by a significant margin but has proven to be hard to beat in her career thus far. Yoneyama and Yamashita begin the match for their teams, they try to knock each other over until Yoneyama sneaks in a quick schoolboy. Yamashita fires back with a shoulderblock, Matsumoto comes in and they double team Yoneyama. Matsumoto stays in and throws down Yoneyama by the hair before hitting a dropkick, delayed scoop slam by Matsumoto and she covers her for two. Matsumoto tags Yamashita, scoop slam by Yamashita and Matsumoto comes back in so she can hit an assisted double kneedrop. Crab hold by Yamashita but Kuragaki has seen enough and she breaks it up. Yoneyama hits a double armdrag on Yamashita and Matsumoto, then both she and Kuragaki double team them in the corner. Kuragaki stays in and hits a delayed vertical suplex on Yamashita, getting a two count. Scorpion Deathlock by Kuragaki, but Yamashita gets a hand in the ropes to force a break. Kuragaki tags in Yoneyama, running senton by Yoneyama but Yamashita fires back with a shoulderblock. Lariat by Yamashita and she knees Yoneyama in the face, covering her for two. She tags in Matsumoto, lariat by Matsumoto and she puts Yoneyama in a backbreaker before flipping her over into a gutbuster. Matsumoto gets on the second turnbuckle and hits a reverse splash double kneedrop, she goes for the backdrop suplex but Yoneyama blocks it. DDT by Yoneyama and she hits a running knee, giving her time to tag in Kuragaki. Backdrop suplex by Kuragaki, she gets on the top turnbuckle as Yoneyama comes in, and Kuragaki throws Yoneyama down onto Matsumoto. Diving body press by Kuragaki, but Yamashita breaks up the pin. Kuragaki goes for a powerbomb but Matsumoto back bodydrops out of it, they both go for lariats until Matsumoto wins the battle. Kuragaki then floors Matsumoto with a lariat of her own, she goes up top but Yamashita grabs her from the apron. Matsumoto grabs Kuragaki but Yoneyama comes in, Matsumoto powerbombs Yoneyama into Kuragaki and then hits a sit-down powerbomb on Kuragaki for a two count. Back elbow by Matsumoto and Kuragaki and she hits a lariat, but Yoneyama breaks up the cover. Yamashita runs in but she lariats Matsumoto by accident, then Kuragaki lariats both of them. Yoshi Tonic by Yoneyama to Matsumoto, Kuragaki picks her up and she nails the Jikiden Falcon Arrow for the three count! Kuragaki and Yoneyama are the winners. Since this card is in memory of Plum Mariko, a few JWP wrestlers have come over as that was Mariko’s home promotion. Leon is a long time respected veteran based in JWP and is a multi-time tag team champion with her friend Ray. Kaho is one of my favorite young wrestlers, she is part of the K4 group on OZ Academy which is the lead “good guy” faction. This should be a high speed match as both are smaller and can really go, but probably more mat based than you’d expect. They go right at it, trading quick trips and bouncing off the ropes, but neither gets a clear advantage. Dropkick by Kaho, she puts Leon in the ropes and dropkicks her in the back for a two count. Scoop slam by Leon and she hits a somersault senton, she puts Kaho in a crab hold before picking her up and applying a headscissors. Kaho gets into the ropes, she Irish whips Leon into the corner and she hits a dropkick. Leon returns the favor with her own dropkick, elbow by Leon but Leon returns fire and they trade blows. Leon slams Kaho into the corner and goes for a spear, but Kaho flips out to the apron and hits a missile dropkick. Kaho picks up Leon and elbows her, dropkick to the knee by Kaho and she dropkicks Leon again while she is on the mat. Running senton by Kaho, but Leon kicks out. Elbows by Kaho but Leon catches her with a tilt-a-whirl backbreaker, she goes for a crab hold but Kaho reverses it into a roll-up for two. Leon puts Kaho in a stretch hold and then puts her in a Texas Cloverleaf, but Kaho gets to the ropes. Elbow to the back by Leon, she goes up top and she hits a rope running dropkick for a two count cover. Leon goes off the ropes but Kaho dropkicks her, enzuigiri by Kaho and she dropkicks Leon while she is leaning against the ropes. Fisherman suplex by Kaho, but Leon gets a shoulder up. Spinning slam by Leon, she goes up top and she hits a diving body press for a two count. Leon picks up Kaho but Kaho sneaks in an inside cradle for two. They trade quick pin attempts with neither getting the three count, Kaho elbows Leon but Leon catches her with a spear. Leon picks up Kaho but Kaho blocks the Capture Buster, high kick by Leon and goes for it again, but Kaho goes for an inside cradle. Leon blocks the inside cradle and scoops up Kaho, dropping her with the Capture Buster for the three count! Leon is the winner. Here are the rest of Mission K4, with AKINO and company being the main group to battle against the evil Ozaki-gun in OZ Academy. AKINO and Kato are both long time veterans, while Kagetsu debuted in 2008 with Sendai Girls’. On the other side, Aja Kong and Kyoko are two of the best known and most dangerous Freelancers on the scene, and they are teaming with Kyoko’s daughter who just debuted a few months ago. Hana is the clear weak link of the teams as she has had less than ten professional matches, but she has a strong team with her to protect her against Mission K4. hits a rolling fireman’s carry slam for a two count. Kato goes up top but Hana avoids her dive, she tries to tag in her mom but Kato blocks it. Kyoko comes in anyway and boots Kato into the corner, jumping knees by Hana and she tags in Kong. Kong lariats Kato but Kagetsu and AKINO come in, Kong lariats all three of them since she is Aja Kong but Kato catches her with a German suplex. Kato tags AKINO, AKINO and Kong go back and forth with strikes but Kagetsu comes in and kicks Kong in the head. Backdrop suplex by AKINO to Kong, she picks up Kong but Kong slaps her and hits her own backdrop suplex. Kong tags in Kyoko, kicks to the face by Kyoko to AKINO, but AKINO catches her with a high kick. AKINO tags Kagetsu, Kagetsu and Kyoko trade elbows, spear by Kagetsu and she covers Kyoko for two. Kyoko applies a sleeper but AKINO comes in and puts Kyoko in a sleeper as well. Hana runs in and dropkicks AKINO but Kato elbows Hana to the mat. Kong slaps Kato, but Kagetsu hits a missile dropkick on Kong. AKINO goes up top and dives out of the ring onto Kong, while in the ring Kyoko puts Kagetsu in a Cobra Twist. Kagetsu gets out of it and hits a Samoan Drop, missile dropkick by Kagetsu but Kyoko falls in her corner and tags in Hana. Kato is tagged in too and she kicks Hana, but Hana gets a shoulder up on the cover. Hana ducks Kato’s next high kick and applies a sleeper, but Kato kicks out of it. Dropkick by Hana and she hits three more, covering Kato for a two count. Hana goes up top and hits a missile dropkick, she picks up Kato but Kato kicks her repeatedly in the head. Kyoko runs in and boots Kato, giving Hana a chance to suplex Kato for two. Sleeper by Hana to Kato but Kato snapmares out of it, quick sunset flip by Hana but it gets a two count. Big boot by Hana, she picks up Kato but Kato nails a high kick. Samoan Driver by Kato, she goes up top and she delivers the diving leg drop for the three count! Mission K4 win the match! As I mentioned above, this show has a bit more of a JWP feel, which is why this match is here. 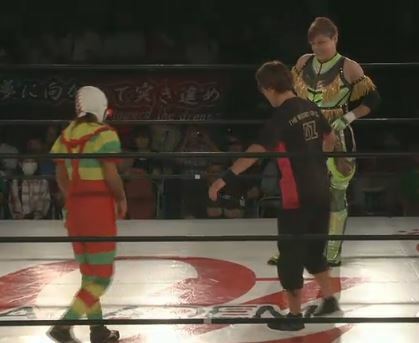 Bolshoi Kid is Command Bolshoi, but she is going old school and wrestling in her old full clown outfit for the occasion. Kansai is an OZ Academy wrestler but she was in JWP for much of the 90s, so it is a bit of a throwback having her in the match as well. This match is more about nostalgia than about putting on a high work rate match, but I am sure Kansai will have fun slamming Bolshoi Kid around while she is trying to goof off. Bolshoi Kid of course dances to start the match, she tries to catch Kansai off guard with a kick but she isn’t able to Irish whip her. She offers Kansai a gift but Bolshoi attacks her from behind, Bolshoi Kid walks the ropes all the way around the ring but Kansai blocks the armdrag. Bolshoi manages to get Kansai out of the ring but she does a fake dive and poses instead of going out after her. Kansai is in on it and poses with her, as they laugh at each other’s antics. Everyone just having fun here. Kansai does return after a moment, low blow by Bolshoi and she wraps a rope around Kansai’s neck before snapping it back into her. Kansai hits a vertical suplex which is probably the first real move of the match, she goes up top to do a move but in the meantime Bolshoi Kid has moved way too far away. Kansai gets to Bolshoi Kid and lariats her into the corner, she then gets the tag team rope and chokes Bolshoi with it, but the rope snaps back at her and knocks Kansai to the mat. Kansai tries the same trick to move away from the corner when Bolshoi goes up top, but Bolshoi doesn’t fall for it and covers her for two. Kansai puts Bolshoi in a stretch hold, she lets her go after a moment and puts her in a Claw Hold before hitting a big backdrop suplex for a two count. Splash Mountain but Kansai, and she gets the three count! Dynamite Kansai is your winner. Obviously this was a comedy match, which we knew going in but it was even more comedy based than I expected. This is why some people that watched JWP in the mid-90s kinda hated Bolshoi, as comedy can be hit and miss. As a throwback match this was fine, Command Bolshoi doesn’t usually wrestle in this style and Kansai appeared to be having fun. Not really my type of match but it gave me a few chuckles and served its purpose. Main Event time! Shida and Syuri are Freelancers that have been teaming around the circuit, which is fine with me as they are both fantastic and are two of the best women wrestlers in Japan. Ozaki and Ohka are the two highest ranking members of the Ozuki-gun Army, the main heel faction in OZ Academy. Out with them is Police, their manager/cheater, and their friend Mio Shirai is the referee. So the odds are stacked against the Freelancer Dream Team. Keep in mind as we roll along that Shida and Syuri have weapons too in their arsenal (a kendo stick and a giant bat, respectively), so the fact they are outnumbered isn’t as bad as it looks. They are jumped before they can even get into the ring however and beaten around the floor, with Police happily joining in. Shida has chairs thrown at her along with other forms of brutality until Ozaki and Shida finally get in the ring as Ozaki beats her with a chain. Ozaki tags in Ohka, who comes in with her whip and she hits Shida with it several times, cover by Ohka but it gets a two count. Ozaki returns and Shida is triple teamed in the apron, Ozaki puts Shida in a choke hold and rakes her eyes until Syuri comes in to break it up, but Mio sends Syuri back out to the apron. Ozaki tags Ohka as the beatdown on Shida continues, she finally gets the upper and suplexes Ohka into Ozaki. She makes the hot tag to Syuri, kicks by Syuri to both Ozaki and Ohka and she gets her giant bat. She throws it at Ozaki and covers her, but Mio won’t make the count. Ohka jumps Syuri from behind but Syuri kicks both of them before hitting a suplex on Ozaki. PK by Syuri, she gets her bat again as Police comes in with a chair, Syuri hits the chair out of his hand and then nails him with a high kick. Syuri stacks Police and a chair onto Ozaki and then rams the bat down onto both of them, but Ozaki hits a spinning double chop and tags in Ohka. Diving crossbody by Ohka and she puts Syuri in a stretch hold, big boot by Ohka and she hits a backdrop suplex on Syuri for a two count. Syuri and Ohka trade elbows, German suplex by Syuri but Ohka rocks her with a big boot. Ohka goes off the ropes but Syuri catches her with a jumping knee, she tags in Shida and they double team Ohka. Shida hits a vertical suplex but Ozaki comes in to help, Syuri comes in too and they suplex Ohka and Ozaki. They go for running strikes on Ohka but Ohka moves and hits a double face crusher on both of them. Ohka kicks Shida repeatedly, brainbuster by Ohka and she covers Shida for two. Ohka tags Ozaki who comes in with her chains, and she whacks Shida with them. Shida gets her kendo stick and hits Ozaki with it but she eats the chain again for her trouble. They take turns until Ozaki takes the kendo stick and hits Shida with it over and over, Ozaki goes up top but Syuri grabs her from the apron. Shida recovers and she suplexes Ozaki back into the ring, cover by Shida but it gets two. Ozaki and Shida trade elbows, Falcon Arrow by Shida but Police breaks it up. Police lariats Shida, Shining Wizard attempt by Ozaki but Shida blocks it and hits the Three Count. They trade quick pins, Syuri comes in and she boots Ohka out of the ring. Syuri goes up top and hits a missile dropkick, Backstabber by Syuri and they both hit running knees on Ozaki. Cover, but Police throws a chain at Shida to break it up. Ohka comes in but she whips Ozaki by accident, Police runs in with a chair but he hits Ozaki by accident as well. Shida and Syuri dropkick Police, Ozaki tries to blow mist into Shida’s face but she hits Mio with it. Falcon Arrow by Shida to Ozaki, a new referee comes in and does the count but it gets a two. Shida goes off the ropes but Ozaki catches her with a spinning chop, Shida hits Ozaki with her kendo stick and she nails the Three count for the pinfall! Shida and Syuri are the winners! I am not sure if OZ Academy just felt inspired today but this is one of their better full events I have seen in awhile. Ozaki-gun was contained to just one of the six matches and it was one of the better Ozaki-gun matches I have seen, and all the other matches brought something unique to the table. Mission K4 are all great, and while the comedy match wasn’t my cup of tea it did give the crowd a bit of a break before the main event. The only downside is that none of the matches reached the highest level but it was still really solid from top to bottom, worth watching for sure.